(i) P is sitting next to Q. (ii) R is sitting next to S.
(iii) S is not sitting with T.
(iv) T is on the last end of the bench. (v) R is on the 2nd position from the right. (vi) P is on the right of Q and T.
(vii) P and R are sitting together. 1. Where is P sitting? 4. What is the position of S? 5. What is the position of Q? Definite information: A definite information is one when the place of object/man is definitely mentioned. Comparative information: In such information the place of object/man is not mentioned definitely but only a comparative position is given. In other words the positions of objects/men are given in comparison to another objects/men. Step II: Fill up as many empty places as possible using all the definite informations. Step III: With the help of comparative information consider all possibilities and select the possibilities which does not violate any condition. A, B, C, D, E, F, G and H are sitting around a circle facing at the centre. D is second to the left of F and third to the right of H. A is second to the right of F and an immediate neighbour of H. C is second to the right of B and F is third to the right of B. G is not an immediate neighbour of F.
Question 1. How many of them, are there between H and C? Question 2. Who is to the immediate left of A? Question 3. In which of the following pairs is the first person sitting to the immediate left of the second person? Question 4. Who is fourth to the right of B ? Question 5. What is E’s position with respect to G? Directions: On the basis of the information given below, select the correct alternative as answer for the questions which follow the information. (i) A, B, C, D, E, F and G are sitting on a wall facing east. 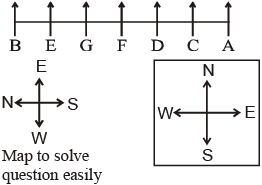 (ii) C is just right of D.
(iii) B is on end point and E is his neighbour. (iv) G is sitting between E and F.
(v) D is third from south end. Question 6.Which of the following is a pair of parsons who is on end points? Question 7. Which of the following information is not necessary to determine the position of A? Question 8. D is sitting between which of the following pairs? Question 9. C want his seat as third from north, he will have to exchange the seat from which person? Question 10. Who is seated right side of E ? 6. (2): A and B is a pair of persons who is at the end points. 8. (3): D is sitted between C and F.
9. (4): He will have to exchange his seat from G.
10. (5): G is seated right side of E.